Gas fireplace alternatives could be as simple as installing gas logs that primarily are viewed as decorative-only and not as a true heat source, whereas a direct vent appliance would be a good option to consider. 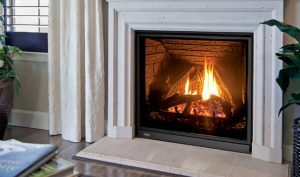 Two worthy characteristics of a direct vent fireplace: by remote control the flame can be raised or lowered as well as the fan speed can be increased or decreased for the comfort of the individuals in that room at that time. If you are considering a gas a fireplace, I would highly recommend investing in a direct vent gas fireplace. This either be vented out the back of the fireplace or up the chimney. Often individuals who are considering this heat source might also desire a change in the look of the fireplace brick or stone or mantel. It’s a great time to do a changeover, but either way a direct vent gas fireplace offers a good return on investment for the homeowner. If you would like a free in-home evaluation or like to visit us at our shop, we’d be more than glad to provide you information so you can make a more informed decision for your household.